The best way to make young people acquainted with contemporary art is to get real works of art in their hands, say Belgian couple, Frans Baetens and Magda Vangils of Muka Gallery. As part of its extensive tour around New Zealand the Muka Youth Print Exhibition will pop up for the day on Saturday 26 November in the Sarjeant Gallery’s classroom, giving young people the chance to choose and buy their favourite work of art. This is the 15th year the Sarjeant will host the popular event. The works on offer are small (100x200mm) original, limited edition lithographs by well-known artists from all over the world and will be sold exclusively to young people aged between five and 18. The names and signatures of the artists are covered over during the shows as art appreciation is the aim rather than the fame of the artist or investment potential says Mr Baetens. 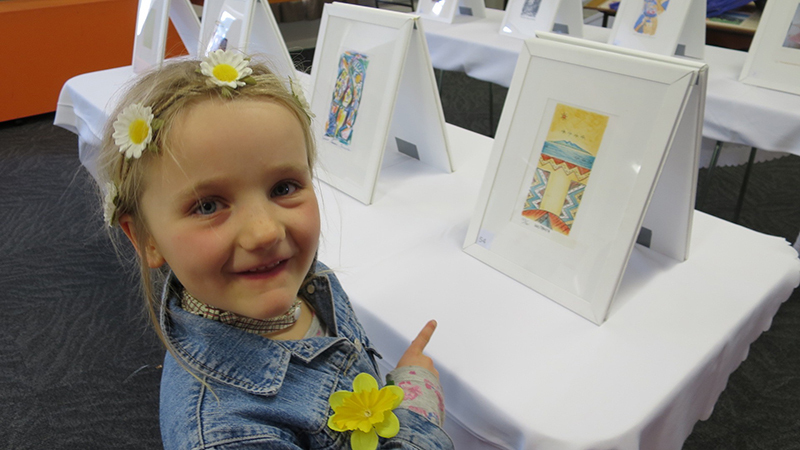 People who bought prints from their shows as children now bring their children to what has become New Zealand’s longest on-going art event. “Some people have huge collections because they have been doing this every year,” Mr Baetens says. “My wife asked the artists to do work for young people with the understanding it should not be distingushable from their normal work.” Since the first show in Auckland in 1987 more than 60,000 works have found their way into the collections of 20,000 New Zealanders. Over the years they have shown the works of around 106 artists of which 88 are New Zealanders, artists such as (in past shows) Ralph Hotere and Tony Fomison. The same collection travels to Belgium, Denmark, Germany and the Netherlands. There is a limit of three prints per person at a cost of $70 each, unframed. Buyers can purchase prints only for themselves, not for adults and visitors can enter the exhibition space only once. Mobile phones and cameras are not permitted. This is the first year Mr Baetens and Ms Vangils will not accompany the exhibition however they confidently leave the running of the show in the capable hands of Sarjeant Gallery staff. Prints by 10 New Zealand and 10 international artists. Visitors must be under 19, adults not allowed in. All prints $70. This story was first published in the Wanganui Chronicle on 22 November, 2016.